Gordon Tang Milo Umeke 5.25" x 3"
Gordon’s traditional Hawaiian shapes are widely appreciated by collectors of Hawaiiana both for functional and decorative purposes. 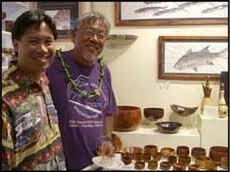 A number of people collect his bowls for poi supper, luckies! 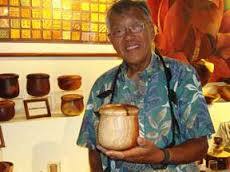 Honolulu Woodturners member Gordon Tang, with more of his work in the background.